The U.S. state of Pennsylvania has 4 lighthouses, 3 active, on its short Lake Erie shoreline in the northwestern corner of the state between Ohio and New York. The Presque Isle Partnership has formed a commitee, Keepers of the Erie Lights, to support the restoration of the three historic light stations. All four lighthouses are readily accessible. Pennsylvania also has a coastline on the Delaware River at the southeastern corner of the state; lights in that area are described on the Southeastern Pennsylvania page. Aids to navigation in northwestern Pennsylvania are maintained by the U.S. Coast Guard Ninth District, but ownership (and sometimes operation) of historic lighthouses has been transferred to local authorities and preservation organizations in many cases. ARLHS numbers are from the ARLHS World List of Lights. USCG numbers are from the U.S. Coast Guard Light List Volume VII. Excellent photos and accounts by Kraig Anderson. This site by Neil Schultheiss has good photos and information on the lighthouses. Photos and accounts by Christine and Tom Cardaci. Nautical charts for the coast can be viewed online. Chart 14835 covers the Erie area. 1873. Active; focal plane 73 ft (22 m); white light, 3 s on, 3 s off. 67 ft (20.5 m) square cylindrical brick tower rising from a 1-1/2 story brick keeper's house. 300 mm lens. Tower painted white, lantern and gallery black. A photo appears above, Jimmy Emerson has a good 2008 photo, a 2013 photo is available, Huelse has a historic postcard view, hawn Christopher has a street view, and Google has a satellite view. The Coast Guard has historic photos taken before and after the height of the tower was increased by 33 ft (10 m) in 1896. Presque Isle is a large spit (a glacial moraine) projecting toward the northeast and protecting Erie Harbor; the entire spit is now included in a Pennsylvania state park. The lighthouse was transferred to state ownership in 1998. In 2006 a new preservation organization, Keepers of the Erie Lights, launched a fundraising drive to restore the grounds and rebuild outbuildings. The Pennsylvania legislature approved a vanity license plate featuring the lighthouse; $17 from the sale of each plate goes toward the restoration effort. A 2007 architectural study estimated that a complete restoration of the building would cost about $880,000. In 2011 there was a plan for a more limited restoration that would cost $450,000, but no funds were available. 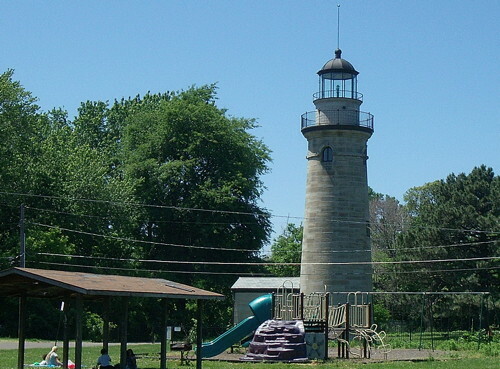 In December 2012 Portia Norton, a local resident, donated $196,348 to establish an endowment fund for the lighthouse and the nearby Perry Monument. The keeper's house was for many years a residence for the state park manager, who was required to live in the park. In 2014 the state scrapped that requirement and agreed to lease the lighthouse for 35 years to a non-profit group, the Presque Isle Light Station. The group is offering public tours while working to restore the building to its appearance around 1900. In 2018 the station's garage was renovated as a welcome center and gift shop. Located on the beach in Presque Isle State Park (end of PA 832). Site open, lighthouse and tower open to guided tours daily from Memorial Day weekend (late May) through Labor Day (early September), and on Friday through Sunday for the rest of September and through the Columbus Day weekend in mid-October. Owner: Pennsylvania Department of Conservation and Natural Resources (Presque Isle State Park). Site manager: Presque Isle Light Station . ARLHS USA-666; USCG 7-3690. Note: Erie Harbor, also called Presque Isle Bay, is an oval-shaped lagoon sheltered by the peninsula of Presque Isle. The shallow entrance to the lagoon, at its east end, is held open by a dredged canal. The enclosed bay is vulnerable to pollution, but in recent years there have been strong efforts to restore it to health. In February 2013 the U.S. Environmental Protection Agency removed the bay from its list of Great Lakes Areas of Concern. 1857 (station established 1830). Active; focal plane 42 ft (13 m); red flash every 2.5 s. 34 ft (10 m) square cast iron tower, covered with steel plates and with lantern and gallery. Lighthouse painted white with a horizontal black band; the lantern is also black. 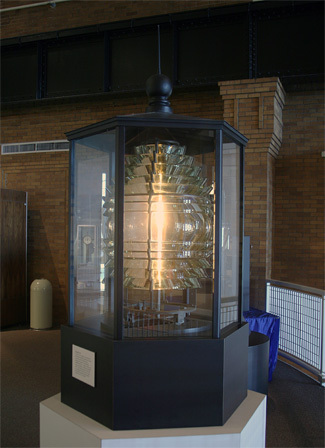 Solar-powered lens (1995); the original 4th order Fresnel lens is displayed at the Erie Maritime Museum. C.W. Bash's photo is at right, Wikipedia's page has a good photo, Shawn Christopher has a 2016 street view, and Google has a satellite view. The lighthouse replaced an 1830 wood tower destroyed by collision with a ship in 1855. No other surviving U.S. lighthouse shares this design. The lower portion of the tower was open originally; it was enclosed sometime in the 1890s. The present steel plates were added in 1940. The tower has been moved three times (in 1882, 1891, and 1940) to accommodate extensions of the pier. Located on the north side of the Erie Harbor channel entrance at the eastern end of Presque Isle State Park, close to the Coast Guard Station Erie. Accessible by walking the pier. Site open, tower closed. Owner/site manager: U.S. Coast Guard. ARLHS USA-274; USCG 7-3495. Date unknown. Active April through October (privately maintained); focal plane 32 ft (10 m); white flash every 2 s. 36 ft (11 m) round cylindrical steel tower, rising through the center of a square gazebo. Lighthouse painted white, lantern black; gazebo painted white with a blue metal roof. The Cardacis have good photos, and Google has a satellite view and a distant street view. The gazebo was added sometime between 2006 and 2010. Located on the outer arm of the east breakwater of the yacht club, off PA 5A and Virginia Avenue on the west side of Erie. Site open, tower closed. Owner/site manager: Erie Yacht Club. ARLHS USA-1313; USCG 7-3660. 1867 (station established 1818). Inactive 1881-1885 and since 1899. 49 ft (15 m) round sandstone tower with lantern and gallery, unpainted. Lantern roof and watch room painted white. 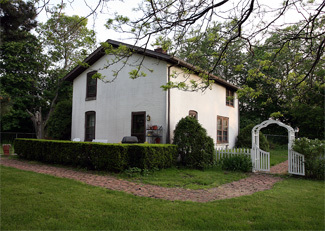 The original 2-story wood keeper's house, renovated in 1979, provides a residence for the park caretaker. Wikimedia has several good photos, the Cardacis have a page with photos, Huelse has a historic postcard view, and Google has a closeup street view and a satellite view. The original lighthouse was replaced in 1858; both of the first two towers were abandoned due to settling of their foundations. 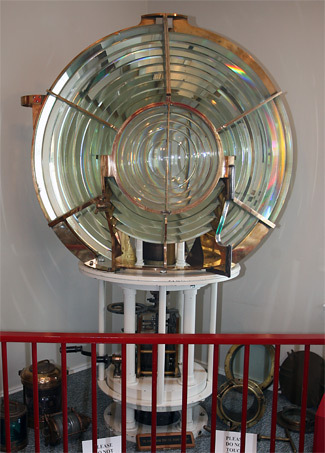 The original lantern and 3rd order clamshell Fresnel lens were removed around 1900, when the light was deactivated, and transferred in 1902 to Marblehead Light in Ohio; the lantern remains in use there and the lens is now on display at the Marblehead keeper's house. The lantern was replaced by a wooden copy in 1989 as part of a partial restoration of the tower. In May 2003 a wind gust blew the lantern off, but it was about to be replaced anyway by a historically accurate replica. 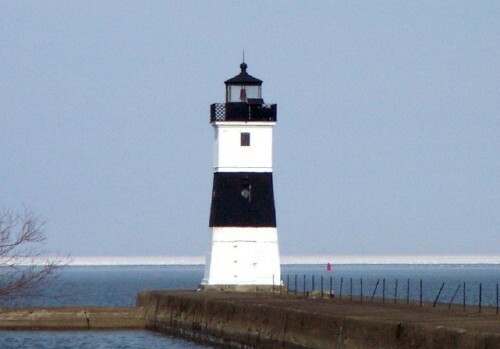 The Erie-Western Pennsylvania Port Authority restored the lighthouse using $390,000 in state grant funds; the project was completed in early 2004. In addition to replacement of the lantern, the project cleaned and repaired the exterior of the lighthouse and the interior stairway. Lighthouse Digest carried a report in April 2004. The lighthouse was rededicated in June. In August 2011 the lighthouse opened for tours for the first time. Archaeologists working at the light station have uncovered the foundations of the 1818 tower, one of the earliest U.S. lighthouses on the Great Lakes. Located in Lighthouse Park at the end of Lighthouse Street in downtown Erie. Site open daily, tower closed except for occasional guided tours organized by the Erie Port Authority and the Erie Playhouse theater; tickets are required and the proceeds benefit the Playhouse. Owner/site manager: City of Erie. ARLHS USA-921. Date unknown. Active; focal plane 19 m (62 ft); continuous green light. Approx. 56 ft (17 m) square cylindrical skeletal tower carrying a rectangular daymark colored red with a white vertical stripe. Google has a street view and a satellite view. The front light is on an 8 m (26 ft) square skeletal tower. Located on the quay on the south side of the harbor entrance, adjacent to a public parking area at the end of Port Access Road. Site open, tower closed. USCG 7-3550. Note: Located west of Meadville about 50 mi (80 km) south southwest of Erie, Conneaut Lake is about 3 mi (5 km) long and 1 mi (1.6 km) wide. The largest natural lake in Pennsylvania, it is surrounded by vacation homes. 1924. Active; focal plane about 33 ft (10 m); continuous (?) white light. Approx. 30 ft (9 m) round tower with lantern and gallery, painted white. Frank Miklos has a photo, Edie Hancock has a photo, and Google has a satellite view. 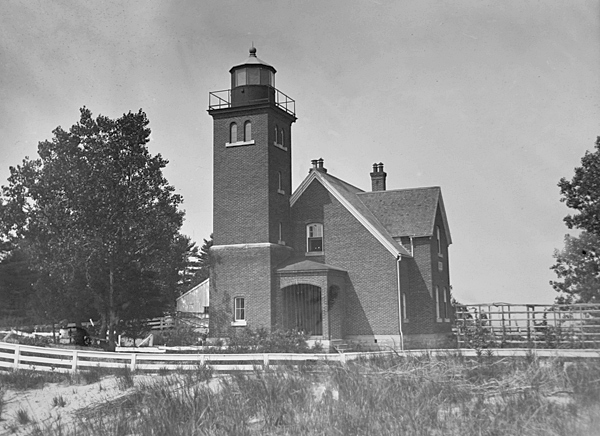 Built by E.H. Shartle, this lighthouse is a familiar landmark of the lakeshore. Located near the southeastern corner of the lake, on Konneyaut Trail. Site and tower closed (private property). Date unknown. Active; focal plane about 25 ft (7.5 m); continuous (?) white light. Approx. 23 ft (7 m) octagonal wood tower with lantern and gallery. 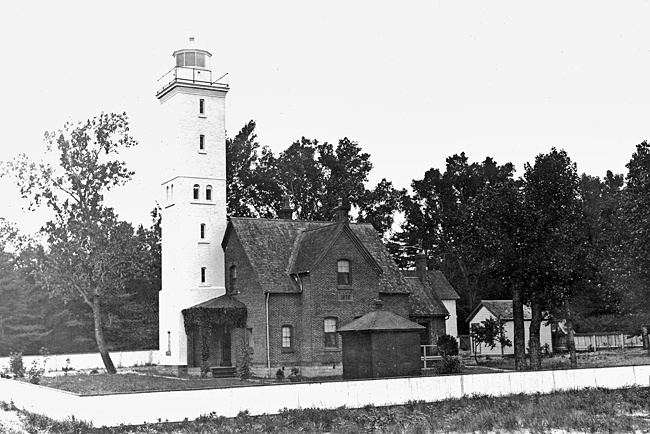 Lighthouse painted white with two narrow red horizontal bands, lantern roof red. No photo available but Google has a satellite view. Located on the east side of a canal entrance at the extreme north end of the lake. Site and tower closed (private property). Bicentennial Tower (1996), a 187 ft (57 m) observation tower on the Erie waterfront, resembles a lighthouse but carries no light. Google has a street view and a satellite view. Erie Waterworks (1906), a small iron tower on the bay side of the Preque Isle Peninsula. There is no evidence that this tower ever served as an aid to navigation. Google has a satellite view. Sherman Memorial (Tionesta) (2006), located on an island in the Allegheny River, is a working lighthouse but not an aid to navigation. Guided tours are offered on the second Saturday of each month June through October. Jennifer DeJulio has a good photo, and Google has a satellite view. Checked and revised December 1, 2018. Lighthouses: 7. Site copyright 2018 Russ Rowlett and the University of North Carolina at Chapel Hill.